Technological advancements aimed at innovating the latest models of microscopes have been very common in the recent past. These efforts are appreciated and encouraged as researchers are in constant need of novel technologies to investigate various types of cells, substances, and materials as minutely as possible. Application of microscopy devices is thus highly relevant in nanotechnology, material science, semiconductor, biotechnology, and life science industries. Among these, the demand for microscopy devices is quite high in the field of life science, as these instruments assist in the study of cellular interactions at biological levels and various other functions. Microscopes are available in different types depending upon their operational capabilities and features. For instance optical microscopes such as stereo microscopes, phase contrasts, and the fluorescence microscopes work on the light reflections, while electron microscopes uses electron beam to produce images and magnify. Overall, the demand for microscopy devices in the field of life science has steadily risen in the last few years and is projected to continue treading along a positive curve in the coming years. According to Transparency Market Research (TMR), the global life science microscopy devices market is expected to reach US$2.0 bn by the end of 2024, from its valuation of US$1.1 bn in 2015. If these figures hold true, the global life science microscopy devices market will exhibit a positive CAGR of 6.5% between 2016 and 2024. Based on device type, the global life science microscopy devices market was dominated by optical microscopes in 2015. The high demand for these microscopes across research laboratories in emerging nations and their increasing applications in clinical/pathology and pharmacology & toxicology, besides their low cost are key reasons behind them constituting the key device category. In 2015, the optical microscopes segment held the dominant share of 51.9% in the overall market. However, due to the prevalence of fierce competition and the entry of new players, growth witnessed in this segment is likely to get restrained in the coming years. Electron microscopes emerged as the second-leading segment based on device type in 2015. However, in terms of volume the scanning probe microscopes segment accounted for the second-largest market share in the same year. Regionally, North America, Latin America, Asia Pacific, Europe, and the Middle East & Africa are the key market segments. Among these regions, North America held the dominant share of 47.3% in the global life science microscopy market in 2015. Their rising funding towards research and development activities in life science and biomedical research will aid the market’s expansion in North America in the coming years. Europe, in the same year emerged as the second-leading regional market for life science microscopy devices. However, TMR forecasts the Asia Pacific market to exhibit the highest CAGR during course of the forecast period. Some of the leading companies operating in the global life science microscopy devices market are Olympus Corporation, Nikon Corporation, Bruker Corporation, JOEL Ltd., FEI Company, Hitachi High-Technologies Corporation, Leica Microsystems, Carl Zeiss Microscopy GmBH, Cameca SAS, and NT-MDT, among others. Microscopy devices are finding wide applications in various fields such as nanotechnology, materials science, semiconductors technology, and life science fields. New and advanced microscopes are being introduced in the market which are enabling researchers around the world to go down at miniature levels, and analyze the substance, cells, and materials, with high throughput, real time and 3D imaging facilities. A new generation of integrated microscopes which come equipped with all the necessary additional features such as imaging instruments and techniques like Raman spectroscopy, high resolution camera, and other features, are expected to drive the growth of the microscopy devices in the life science field. Global life science microscopy devices market is segmented on the basis of device types and application. Device type segment comprises of three major categories of the optical microscopes, electron microscopes, and the scanning probe microscopes. The market overview section of the report comprises qualitative analysis of the overall life science microscopy devices market considering the factors determining the market dynamics such as drivers, restraints and opportunities, along with Porter’s five force analysis and market attractiveness analysis. In addition, such as market opportunity analysis for the device type, application, and key industry developments has also been provided. Key industry developments include the major events occurred in past 4-5 years and are expected to occur during the forecast period which are likely to affect the market dynamics. The global life science microscopy devices market has been segmented on the basis of device type, and application. On the basis of By device type the global life science microscopy devices market is segmented into optical Microscopes (Inverted Microscopes, Stereo Microscopes, Phase Contrast Microscopes, Fluorescence Microscopes, Confocal Scanning Microscopes, Near Field Scanning Microscopes, Others), electron Microscopes (Transmission Electron Microscopes, Scanning Electron Microscopes), and scanning Probe Microscopes (Atomic Force Microscopes, Scanning Tunneling Microscopes). On the basis of application the global life science microscopy devices market is segmented into Cell Biology, Clinical / Pathology, Biomedical Engineering, Pharmacology & Toxicology, and Neuroscience. The market for these device types, and application has been extensively analyzed on the basis of factors such as usage pattern, sales revenue, volume, geographic presence and technological developments. The market size and forecast in terms of revenue (USD million), and volume (Units) for each of these segments, and the sub-segments have been provided for the period 2014 to 2024, considering 2015 as the base year. The report also provides the compounded annual growth rate (CAGR) for each segment for the forecast period 2016 to 2024. 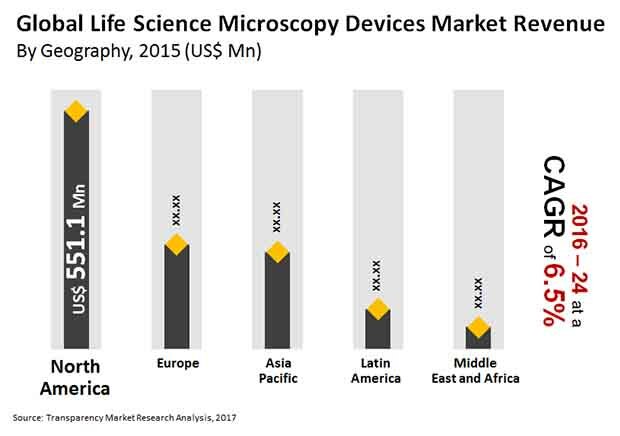 Geographically, the life science microscopy devices market has been classified into five segments namely, North America, Europe, Asia-Pacific, Latin America, and the Middle East & Africa. The market size and volume forecast for each region has been provided for the period 2014 to 2024, in terms of device types, and application, along with the CAGR (%) for the forecast period 2016 to 2024. The report also provides a section on the competitive landscape, wherein the market share analysis of leading players in the global life science microscopy devices market, in terms of percentage share in 2016 (estimated) has been discussed. A list of recommendations has also been included for new entrants as well as existing market players to help them establish a strong presence in the market and increase their market share. The report concludes with the profiles of major players in the global Life Science Microscopy Devices market such as Olympus Corporation, Carl Zeiss Microscopy GmBH, Nikon Corporation, Bruker Corporation, Hitachi High-Technologies Corporation, Leica Microsystems, FEI Company, JOEL Ltd., Cameca SAS, and NT-MDT, among others. The major market players are evaluated on various parameters such as company overview, financial overview, product portfolio, business strategies and recent developments.